. . . on a Journey Through the Past.” Neil Young wrote that. Perhaps he was living in Topanga Canyon at the time, outside of Los Angeles. Canada can look pretty nice from urban California. 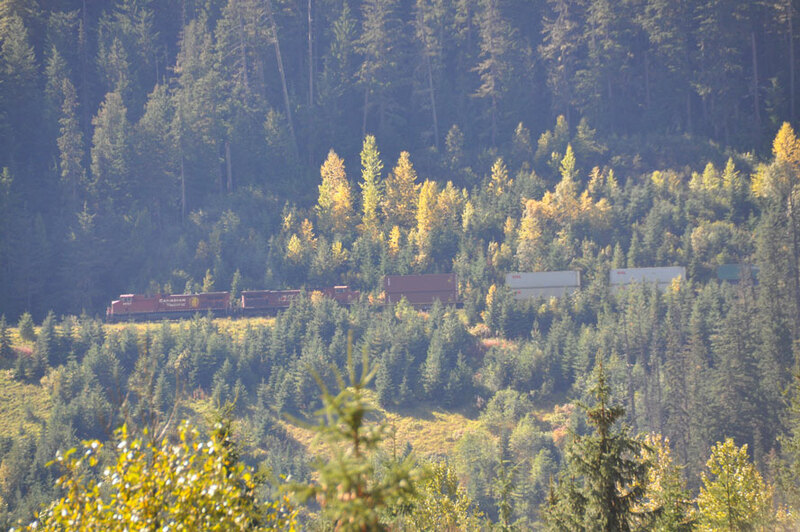 A Canadian Pacific Railway freight, between Kamloops and Golden, BC, heading East. Each of those locomotives produces over 3,000 horsepower, and there are others further back in the train. It’s been 38 years since my amazing summer job in Banff, Alberta, and I’ve been itching to get back there for a long, long time. Never made it, for one reason or another. For $70 per week, I kept the books for one of the transient summer youth hostels that then Prime Minister Pierre Trudeau set up to encourage young Canadians to explore their massive country, a continent in every sense of the word, almost two-thirds of North America. 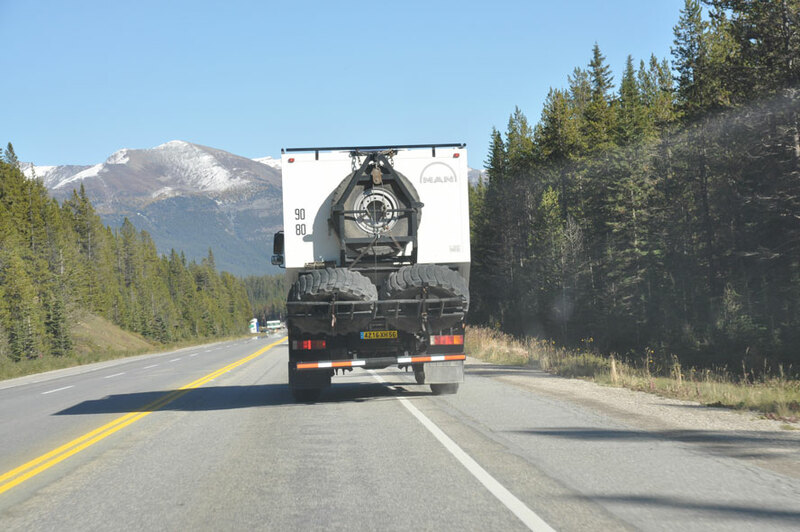 The hostel was located just off the traffic circle where the main road into Banff left the Trans-Canada Highway. It was the perfect job, young people travelling, campfires every evening in the middle of the Rocky Mountains, millions of stars in the crisp night air and a bed in a staff trailer to fight off the cold. Between Golden and Kamloops, heading East. 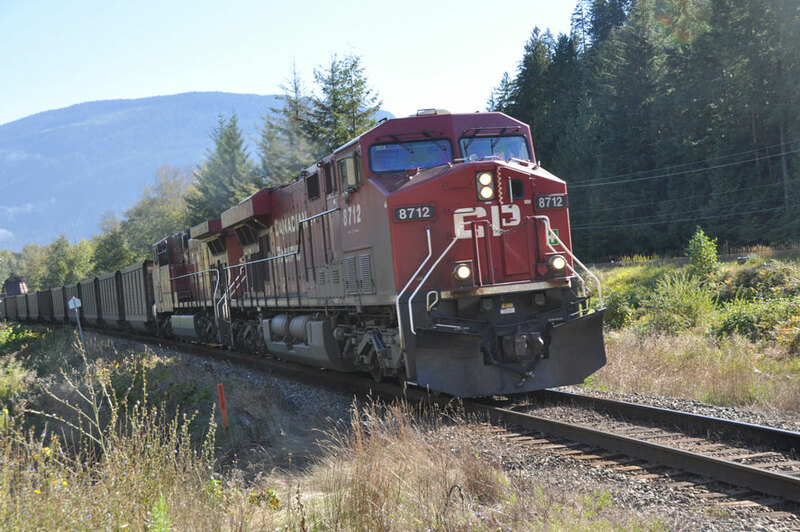 The average length of a Canadian Pacific train in 2004 was around 4,000 feet! Banff is a long way from Santa Cruz, and although I brought up a trip there regularly as a possibility, somehow we never made the journey as a family. But I had to go to Vancouver on a business trip in September, and Vancouver is a mere 572 miles from Banff. So with the business done I rented a car in Vancouver and drove and drove and drove. I love to do that. Just keep driving. Few people share that desire, and so I typically end up doing it by myself. So be it. Not a problem. Driving beautiful highways is best done alone, if not with others who love to do it too, which excludes most children, including mine. A coal train heading West. 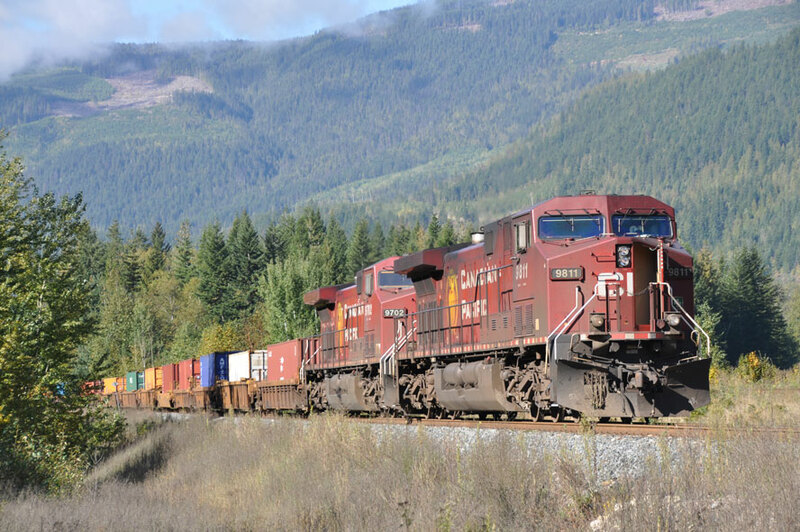 CP hauls hundreds of thousands of tons of coal on their way to Japan. It was a trip of connections, and not just with the past. Vancouver had been very hospitable with me, for instance, as a teenager forty years ago. Forty years: count ’em! I was only there two days this time, but that same hospitality was still in the air. The company that I was visiting treated me as a guest rather then an imposition, although they could have easily seen me as the latter. The morning desk clerk in the hotel asked to be remembered to a colleague when he saw that my client had made the reservation, and his evening counterpart sent me to a lovely cheap fish and chip shop for dinner. 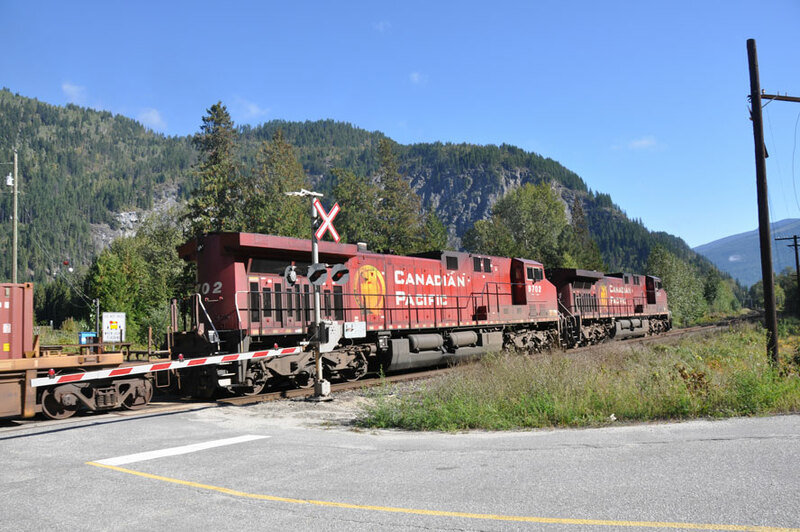 Here’s a piece of the CP line further from the highway, between Golden and Field, BC. . . .
As a teenager, Vancouver was the first city that welcomed an independent Ian. And I have to admit that I was not yet entirely independent. Dave Warrington, an older cousin from Birmingham lived there with his wife Pam, and my month in the city started at their apartment. But they were immersed in the problems of making their newlywed way in the world, finding jobs and the like, and I moved out of their place and in with a household of kids like me, travelers, unattached, exploring being young and alone. I remember discovering Nutella, that tasty French hazelnut spread that looks like creamy chocolate icing, at the supermarket down the street from our shared house. I remember exploring the numerous coasts around and in the city on foot, English Bay, the Lion’s Gate Bridge. It’s a lovely city to explore.
. . . and here’s the same piece of railway line cutting through the trees, complete with all the magnificent scenery. I remember walking across the city to Gastown on those rare occasions when we could afford a drink or two, and drinking Molsoms and Labatts in groups, both us and the beers, that is! I remember hitchhiking in and out, from Montreal the first time I arrived, and to Calgary and back when I got the twitch during that stay. The twitch and I have had a long relationship. Wherever I went, around Vancouver or on the road, I remember how easy it was to meet people there. 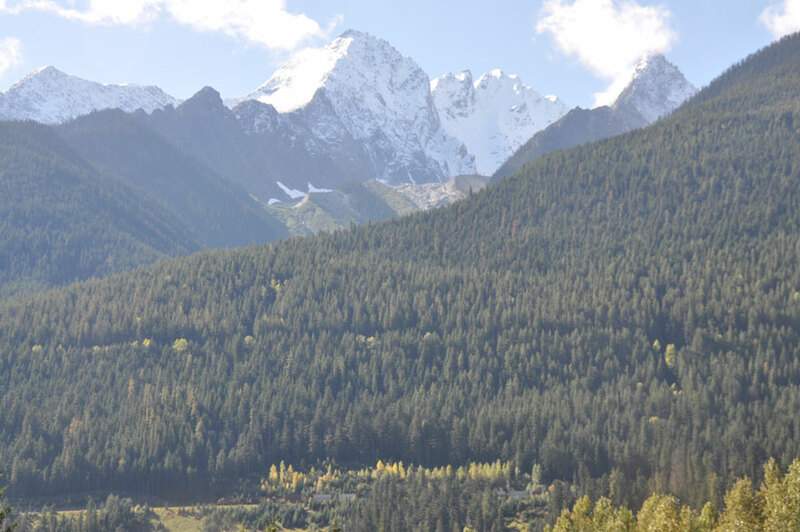 The positive connections continued to flow this trip as I drove East off the Vancouver flatlands in Hope, BC and began climbing the Frazer River Canyon on the Trans-Canada Highway. I’d hitchhiked up or down the canyon maybe six or eight times as a young man, living the wanderlust of youth. That canyon was the first culmination of my urge to go West, young man, go West, in that case with the help of my thumb. Here it is, the painted memorial to the moment when the East and West coasts of Canada were first joined, in 1885. The moment was immortalized in a photo at the time, reproduced full size here. This trip, I was driving my own car, already a very different status, the key advantage of which was that I traveled at my own pace, on my own itinerary. And the first thing I did was quickly find the trains that crawl up and down the walls on each side of the canyon, sharing what flat and open space there is with the highway, the Canadian National on one side, the Canadian Pacific on the other, criss-crossing their respective ways up and down the canyon. These are the railroad lines that fired my imagination as a boy reading dad’s “Railway Wonders of the World,” a four-volume set that his family had given him when he was a boy. The author described the construction of the Canadian Pacific Railway, at a time when nothing crossed Canada apart from an intrepid trapper or two. There were black and white photos of the monster steam locomotives in the mountains and on the trestles and surrounded by the navvies who built this extraordinary railroad. As a boy, I pored over it all for hours and hours. Another shot of Craigellachie, British Columbia, this time with the memorial tableau of Sir Donald Smith driving the spike dwarfed by a passing freight. 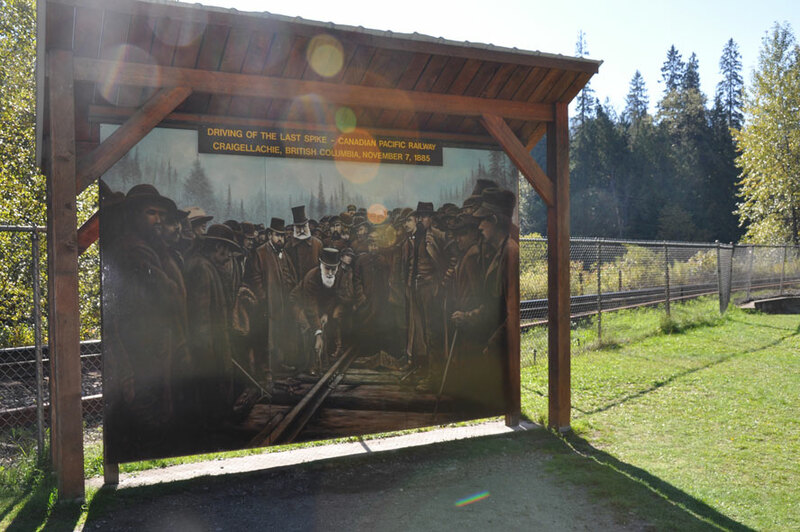 The spikes attached the rails to sleepers, and the last one was the final real connection in Canada’s first transcontinental railroad. They have never disappointed, these railroads across the mountains. 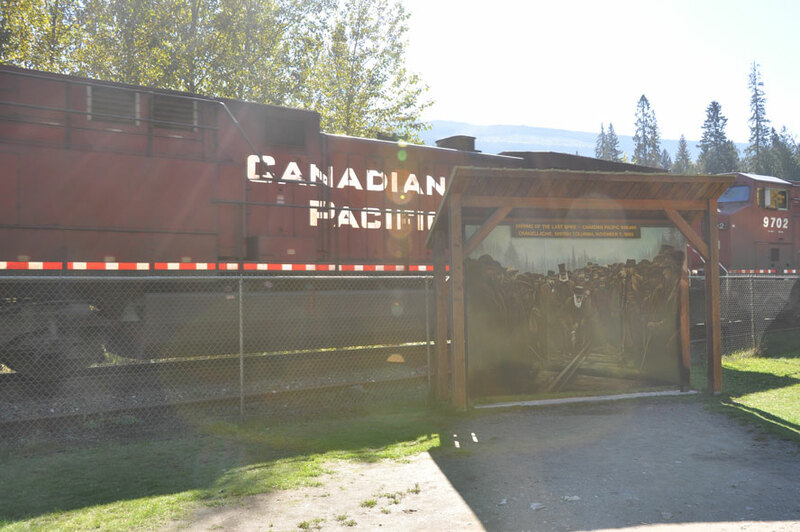 The Canadian Pacific, the older of them, celebrated its 125th year crossing the country in 2010. No steam locomotives any longer, of course, but the powerful diesels of General Electric and General Motors (at least 3,000 HP each) which now power these monster freights up and down the canyon, and up and over the Selkirks and Rockies, have their own particular appeal. I found several to admire during this trip. The trains run much more frequently now than in the 1970s when I last traveled here, and you’re not disappointed if trains are what you want to see. After returning home to Santa Cruz, I discovered why there were so many more trains. The CP now handles East-bound traffic up the Canyon, and the West-bound traffic uses the old CN (Canadian National) rails. So they don’t have to spend all their time waiting for trains going in the other direction. A kind of one-way system for trains: sensible and efficient. Here it is, the Breton “camping car” (RV) built by its Breton driver on a MAN chassis. He told me that it could go anywhere, and had already been in South and Central America, Africa, across Asia, you name it. The family have been on the road for seven years!! On to connections. Driving up the Frazer River Canyon, I passed through the small town of Lytton, half way up the canyon. The local radio station was playing the intriguing story of a World War II German sailor who had made his life in Canada after the war. He had always sought the Allied sailor who had helped him out of the water after his U-boat was sunk by an Allied warship in the North Atlantic. He had been the only survivor from the U-boat, and had always wondered about that friendly sailor in a sea of enemies. He’d found the Allied sailor, finally, in Santa Cruz of all places, and this hero was being interviewed by the Lytton radio announcer as I drove through town! Sweet home Santa Cruz! Here they are, Oded and Daphna, the happy couple, just before our stroll around Lake Louise. The hotel is behind the camera. They told me that it had already snowed in Banff, hard enough to make them considering pulling off the highway. Since their children left the nest, they vacation regularly and explore the world with fervor. The next day, up in the Rockies now, I stopped to admire the spiral tunnels that the Canadian Pacific had built into the mountains on a particularly steep portion of its route, right around the Alberta – British Columbia border. They used the same kind of trick in the Alps. The spiral increases the length of the descent, which makes it less steep for the trains. There was an odd-looking motor home parked at the tunnels, and I duly checked it out. Amazingly enough, the license plate was from the Morbihan, the Breton department where my children’s French grandfather lives and where they have passed some of the best vacations of their youth. Astonishing! You rarely see license plates from that predominantly rural area in England, let alone on the Trans-Canada Highway! Old friends. We’ve been friends for 27 years, since shortly after graduating law school. Oded returned to Tel Aviv in 1986, and I moved to Paris in 1987, but we’ve kept in touch over the years, over the miles. He’s a big fellow, as you can see, and one of the easier people I know to get along with. Daphna took this one. 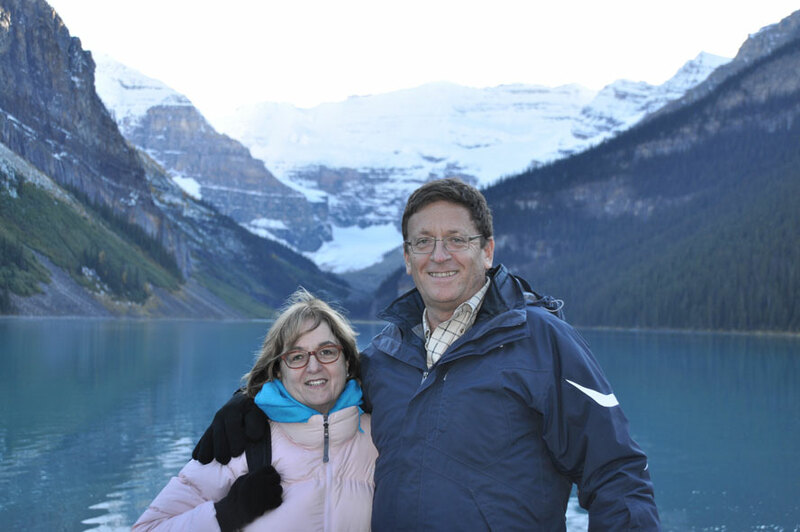 Oded and Daphna, friends since Oded’s and my years working together in a New York law firm with the improbable name of Kronish, Lieb, Shainswit, Weiner & Hellman, were touring the Canadian Rockies this same week. This was already quite a coincidence, especially considering that they live a seriously long way away, outside of Tel Aviv! Planning out the rest of my week in the Vancouver hotel room, I decided that it was time to spend a night at the Chateau Lake Louise. I’d coveted this hotel, built by the Canadian Pacific Railroad, since the summer I worked at the Banff hostel, 1972. This trip, I was finally going to do it. It would be more expensive than other local hotels, but not that much more expensive: this was right between seasons, after the summer and before the ski. We’re talking bucket list here. 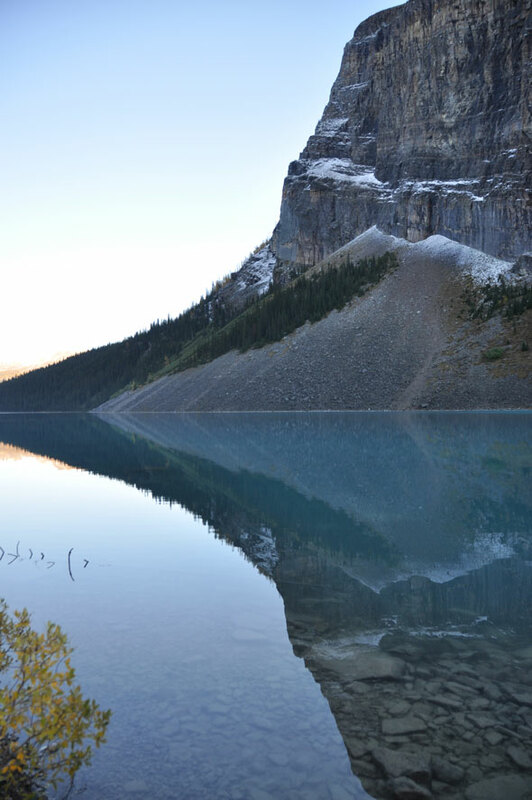 Dusk mirrored in Lake Louise. Oded suggested in an email that we meet up for dinner on Wednesday. After making my reservation, I suggested the Chateau Lake Louise. He emailed me back, almost instantaneously: “guess where we are now?” Yep, the Chateau Lake Louise! Connections upon connections. So they ended up having dinner there two nights running, the second with me. After our stroll around the lake, the three of us sat watching the scenery dissolve into the dusk as we ate. This was not just a good view, this was a window on something magnificent that stays with you. This was the kind of memory that drew me back. It was wonderful to see Daphna and Oded again. We always slot in together so easily, even 27 years after we first met. When was the last time? In San Francisco, maybe five years ago, during another of their vacations exploring the world. But Oded, if you wouldn’t mind aging just a little, those of us who already have would be very appreciative! 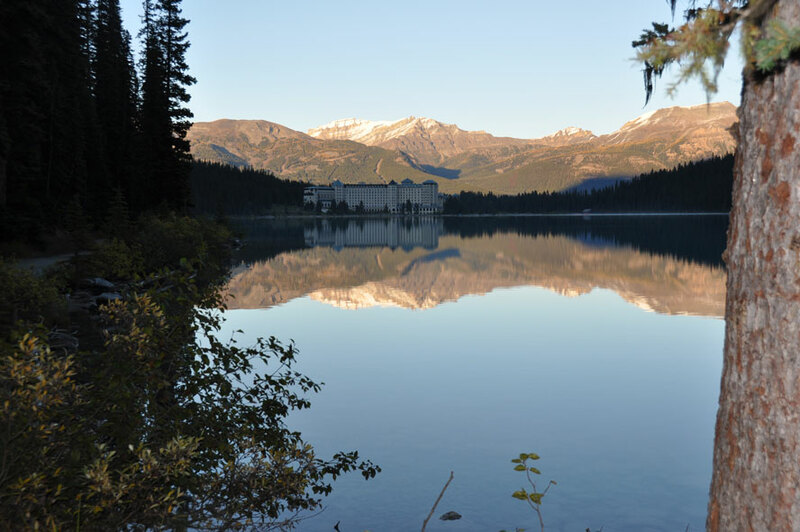 Hiding in the dark at its end of the lake, framed by the Rocky Mountains in the early evening sunshine, the Chateau Lake Louise evokes fairy tales as much as accommodation. We swapped law firm stories over dinner, about the partners at the mid-town Manhattan law firm where we first met and worked together. We were associates then, and even though we’re not any more, it’s the stories about partners that we both enjoy. One was one hell of a lawyer, completely committed to his craft, very hard-working and equally successful. He was also just a teeny bit quirky. His work was his life, and that was that. So he occasionally did things which might strike less hard-working people as a little bit odd. He rebuked me sharply one day for chewing ice in his office while he worked. Then there was the time when a fire broke out in a building near 54th and Sixth Avenue, where we all worked on the 45th floor. The fire trucks responded, the ambulances and police responded and, this being New York, the sirens screamed and caterwauled. This was taken from one of the paths leading to Emerald Lake Lodge cabins. This lodge too was initially built around the turn of the century by the Canadian Pacific to encourage rail tourism. All of the cabins have fabulous views, like this one. Our brilliant partner was heavily involved in drafting a challenging contract, and the noise, worse than ice cracking a hundred times a second, infuriated him. So he sent his secretary down to the street to tell the emergency services to turn their sirens off so that he could work. My guess is that she got a coffee and took a break instead! Another of our dinner stories concerned another equally brilliant, equally successful partner, who lived in a choice Manhattan coop where he was responsible for vetting applicants. It is not enough to have the minimum of several million dollars that any coop in the building costs. No, you also have to pass an interview, conducted by this partner. He was interviewing an applicant one day, a relatively young man, and asked him what he did for a living. “I’m Jerry Seinfeld,” replied the young man. “Yes, I can see that from your application form,” continued the partner, “but what do you do?” This was apparently around the time when Jerry was the most popular man on American television, and so one can imagine his feelings. “I have a TV show,” explained Jerry, helpfully. “Nothing!” replied Jerry, using his catchphrase, and probably throwing the partner for a loop. Now wouldn’t that have been worth seeing! Great story: thanks to hard-working lawyers! 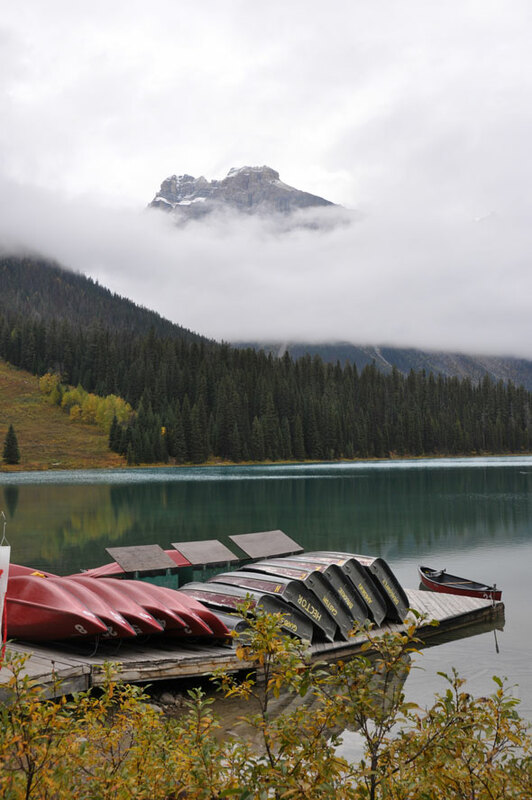 Not that far from Lake Louise, across the border in British Columbia, is Emerald Lake. Morning clouds shroud the mountain looming over the lake. The three of us spent several hours exploring Canada’s little piece of heaven together. 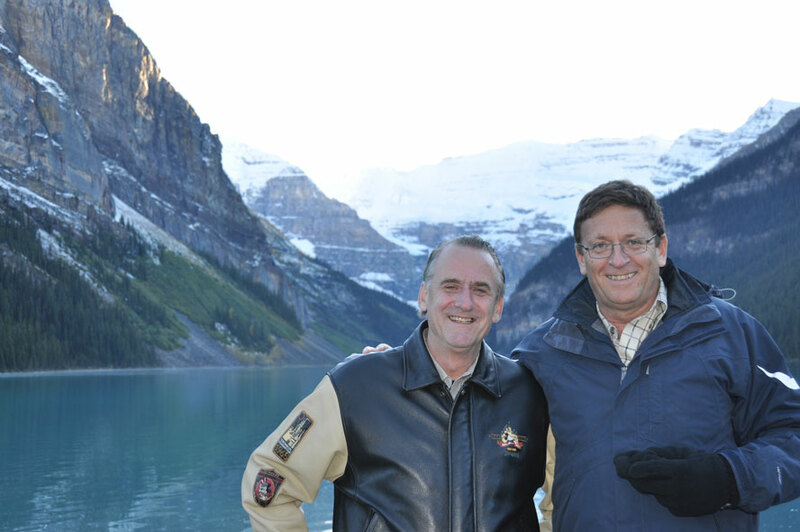 The weather played ball, especially the first evening before dinner as we walked around Lake Louise at dusk. The photos do the talking. The next morning Oded drove us up to Emerald Lake, another of the beautiful high country lakes, and one which he feels suffers from bad PR. 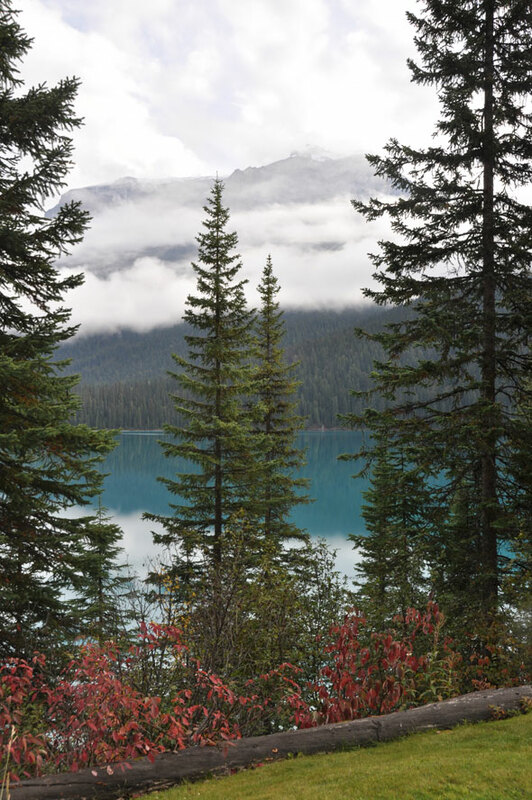 Just across the provincial border in BC, it is so beautiful, and its namesake color so extraordinary, but so little known relative to Lake Louise. How did that happen? Who knows? Oded and Daphna headed for their next stop, New York, and I drove back a different way to Vancouver airport, through Kelowna and the Okanagan Valley. There was a new freeway much of way, built since my youth to reduce the time of the climb up the Frazer River Canyon. With freeways now, British Columbia continues its historical pattern of building transportation routes to bring the people, this time to the inland regions. Long swathes of these new roads have almost nothing on them yet, but one day they will be dotted with civilization. I found myself starting to think about the obvious commercial opportunity that they represented. Yep, I was going home! Come to think of it, I never did make it all the way to Banff. Lake Louise is only about 40 miles west, but I never did drive into town. Oh well, guess I’m just going to have to go back and finish the job . . .